KIEV, Ukraine -- The Ukrainian government is suggesting that power outages that have intermittently plagued the country over the past year can be blamed on hackers supported by the Russian government. 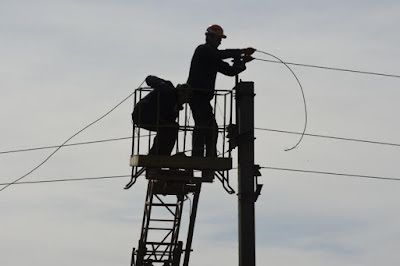 Workers repair high-voltage electricity lines in Vuhlehirsk, Ukraine. Ukraine suspects that Russian-backed hackers are attacking its power grid. It's a serious allegation that, if true, would include the power outages in a small handful of infrastructure failures known to be caused by nation-state attackers. The Security Service of Ukraine (SBU) has detected malicious software on computer networks used by utility companies, the Register, a British tech site, reported Tuesday. Ukrainian officials blamed the rolling blackouts on an “intervention by unauthorized persons in supervisory control package,” according to a translation provided by U.S. security researchers. Perhaps not coincidentally, all this occurred around the same time that attackers flooded technical support departments at a number of utility plants with phone calls, clogging their lines and distracting service technicians. A hack has never been blamed for a confirmed power failure, in part because electricity grids are among the best-defended computer systems in the world. But Stuxnet, a U.S.-Israeli cyberwar operation, caused physical damage in an Iranian nuclear facility, a German steel mill's furnace was targeted by unknown attackers in 2014 and Iranian hackers breached the computers used to control a small New York State dam. But Ukraine's accusation is only the latest in an ugly, and complicated, cyberwar between the two countries since Russia annexed the Crimean peninsula in early 2014. A massive outage in November 2015 plunged 2 million Crimeans into the dark, creating a state of emergency. The attack was later blamed on Ukrainian nationalist groups who vandalized electricity pylons.